I love a day trip. It is so refreshing to get out of the city and go somewhere where the air smells a bit cleaner and the pace is a bit slower. Sometimes, however, outings can be geared towards our little people, which they need to be to a certain extent, to keep everyone happy! My idea of a great day out involves finding a little something for everyone, including the adults, along the way. This is the first post in a series of posts with suggestions of places to go and fun things to do for everyone in the family. We recently spent a fantastic afternoon in and around Yarra Glen and Healesville. What follows is our itinerary. I have also made some further suggestions of places I’d like to visit next time! This is a fantastic park which will keep the children occupied for ages. There is an adventure playground, several swings, a huge sandpit, a spinner, a basket swing, an 8 seater springer rocker (an enormous family sized see saw), undercover picnic tables, plenty of space on the grass for picnics or footy and toilets. Our kids loved the spinner and the basket swing and there really was something for each of them from our 7 year old down to our toddler. There is a skate park adjacent to the park too for older children or those who like their wheels. You can find a full review and photos of McKenzie Reserve here. This is a very popular place, deservedly so. Every time we have visited, however, the cafe has been packed so we have not sat down for an ice cream or a hot chocolate. Despite this, we have been happy to enjoy the free chocolate samples, peer into the kitchen to watch the chocolate makers in action and take our time picking out gifts or treats for later (this was the part that my husband enjoyed the most!) Afterwards, we play outside on the huge lawns and run off the chocolate! From here, it is a short drive to Healesville. OK, this is one for the Mums. There are some gorgeous shops in Healesville and my three favourites are all close together. If the kids are happy to play eye-spy with Dad in the car for ten minutes, you will have time to go to Clarence, K & B and Morris Brown. 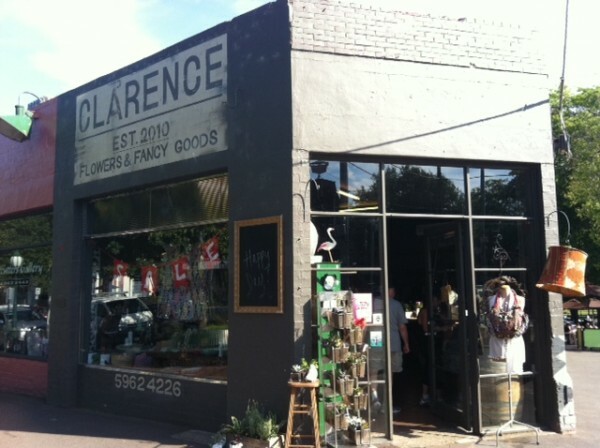 Clarence Flowers and Fancy Goods is a small shop on a corner packed with gorgeous flowers and a well curated selection of quirky finds – from vintage furniture and upcycled treasures, to jewellery, stationary and cool kids’ stuff. I always find something fabulous at Clarence. Across the road and next door to the excellent Healesville Harvest is where you’ll find K & B (Kitchen & Butcher) – a one stop shop – it’s a bakery and charcuterie with fresh produce thrown in. There is a focus on regional products as well as a selection of great home wares – enamel jugs, Robert Gordon milk bottles and french cheese knives. Last time we visited I bought a tray of fresh figs and some K & B granola – delicious! A couple of doors up is Morris Brown. This is another beautiful shop with lots of interesting and vintage pieces. They stock Elk jewellery, vintage home wares, quirky stationary and bags. They are opening an online store shortly. If you can’t get to Healesville , check out their other store in Heathmont. On the cold winter afternoon we visited Healesville, we arrived at the Healesville Hotel for dinner just before 5pm. I am glad we arrived early, because you cannot book in the bar area and just after we arrived several families arrived and were not able to secure a table inside. There is a beautiful and more formal dining room (Quince) in the hotel, however, we were after a more casual dining experience in the front bar area. Having arrived early enough, we managed to snag a table in front of a roaring fire. The kids were happy with the children’s menu and to colour in (we brought our own supplies) while they waited for their meals. My husband and I sat back with a glass of red wine and said to each other, “How good is this?”. We enjoyed a beautiful meal and we vowed to return in summer so we could sit on one of the many picnic tables outside and let the kids run around. 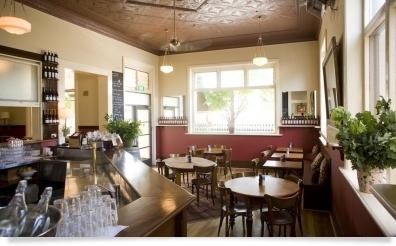 If you are in Healesville at lunch time, make sure you visit the Healesville Harvest next door – it is a great cafe which shares the outside with the hotel as they are all part of the same hospitality group. There are lots of great things to see and do in Healesville and surrounds for families. Next time, we’ll be heading to the Healesville Sanctuary, the Yarra Valley Dairy for some freshly made cheese and then on to the Tarrawarra Winery to check out an exhibition at their Museum of Art and to pick up a bottle of local wine. We might finish up at the the Innocent Bystander/Giant Steps or Zonzo for a pizza. I might also plan an outing for a day when the Yarra Glen market is on but maybe that will be a day out with the girls instead! What are your favourite places in the Yarra Valley? Do you know of any great spots you’d recommend?